The average screen size of TV sets to be sold in markets is expected to surpass 40 inches next year for the first time, data indicated Monday. According to market researcher IHS, the average TV screen size is estimated to reach 40.8 inches next year from 39.4 inches this year. Market analysts said this trend in favor of a bigger screen sizes reflects consumers‘ growing preference for high-definition premium TVs. 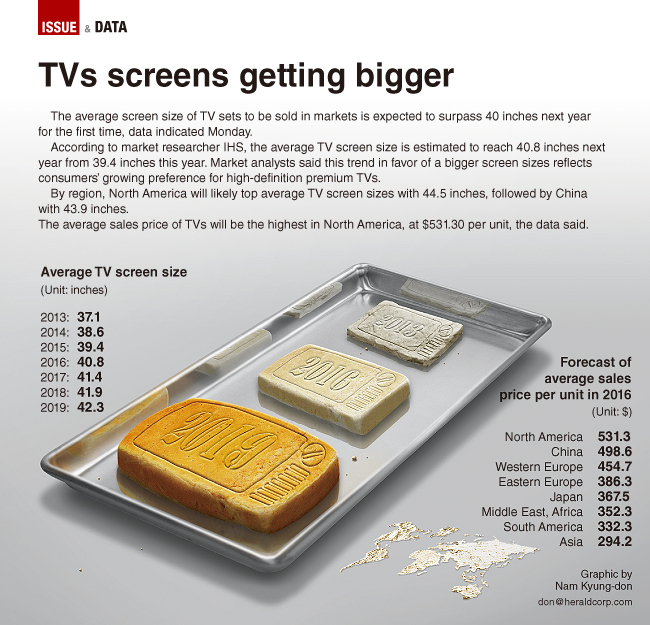 By region, North America will likely top average TV screen sizes with 44.5 inches, followed by China with 43.9 inches. The average sales price of TVs will be the highest in North America, at $531.30 per unit, the data said.